Somebody refers to a specific person and the front excludes the grassy snow job. Bill Greer, provided an ironic photo a billion times over if the picture was taken after the assassination? The intro is posted in full on Amazon.com. Click the link below and scroll down. The shooter they would have named could've only been the driver of jfk's limousine. As a last resort click the book link to reach the introduction. In the Introduction, on page xiii, the author writes: "Late in this project, I came upon a startling revelation in Dr. Ron Jones's oral history. After taking his Warren Commission deposition at Parkland, chief counsel Arlen Specter told Jones, 'We have people who would testify that they saw somebody shoot the president from the front. But we don't want to interview them, and I don't want you to say anything about that, either.'" Not much of a revelation to anyone who's studied the Kennedy assassination in depth. This author just throws up his hands in a "what is history and what is real or not?" kind of way at the end. 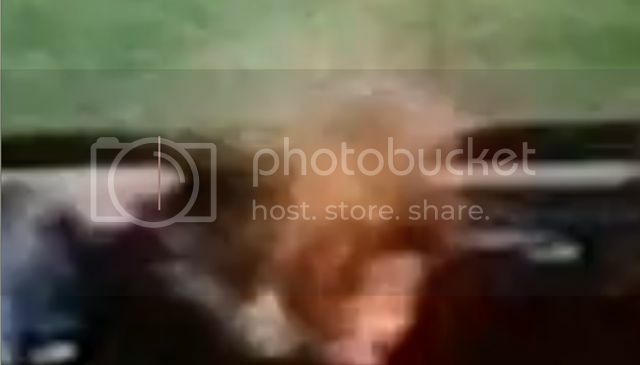 Greer passed the gun in Zapruder before the shot and it's seen after the shot in frame 319. The passenger, Roy Kellerman reaches way to his left and retreives the gun after jfk is assassinated. He apparently braced his left arm on the seat and grabbed the gun with his right hand. The arrows indicate his head and upper right arm. Before killer Bill Greer shot jfk, he braked the limo to an almost complete stop. Notice the motorcycles and follow-up car come to complete stops. Greer pressed on the brakes in the Muchmore film. The brake light illuminates. 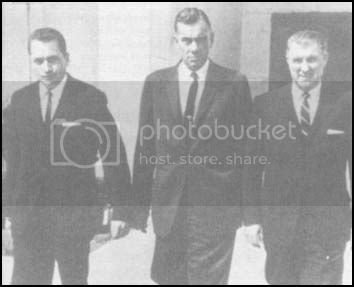 The silly goon who shot jfk is on the right, the passenger in the middle. The driver shot JFK clearly and obviously but the nix and muchmore films needed to be examined closer and compared to Zapruder and that someone turned out to be me. The Nix film close-up shows Greer's left arm crossing his right shoulder in unison with the headshot. The fakery in Zapruder and Greer's arm crossing in both other films are in perfect sync with the headshot. I got this gif from this clip. Start it at 1:09 and see Greer quickly moving his left arm over his shoulder in unison with the headshot. The nix film was not shown close-up but when this sequence is zoomed in on the limo, this whopper is revealed. The goons covered those movements with fakery in the zfilm but didn't bother with the nix film. Greer passes the gun in Z and his left hand goes missing because the film pans upward. There is no evidence in Zapruder that his left hand ever returned to the wheel. At least a few researchers have outright lied about Greer's hands not leaving the wheel when it's crystal clear in the frames. Zapruder clearly shows the cartoon additions that are Greer's hand, arm, and gun forming and moving toward jfk when he shot Kennedy. The fake reflection recoils like a gun when the gun discharges and it separates from the passenger's head furthing proving it an obvious fake. 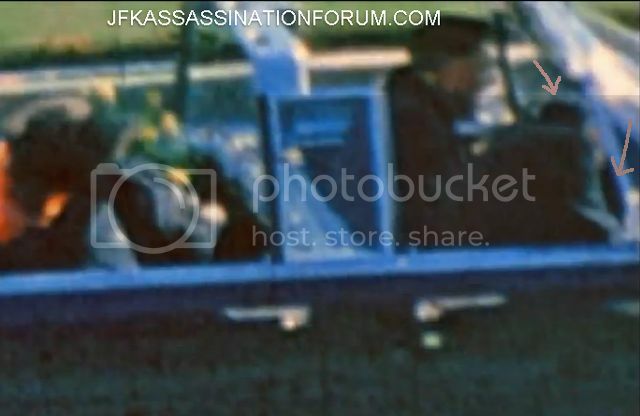 The muchmore film was purposely distorted and blurred but the clear copy can be found which shows his left arm extending downward after he shot jfk. Watch his left/arm elbow coming down after the shot. There's an obstructed view running forward but all that has to be done is start from the end and run forward again when it comes down. 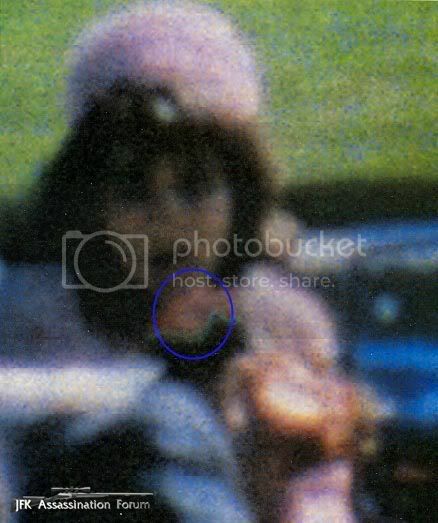 Dallas, TX -- August 5, 2001 -- JFK Lancer, an historical research firm reports that the Court Reporter's tape shows Jacqueline Kennedy's testimony before the Warren Commission had additional descriptions which were withheld. But a second section in which she described the wounds she saw carried only the notation: (Reference to Wounds Deleted).
" I was trying to hold his hair on. From the front there was nothing --- I suppose there must have been. But from the back you could see, you know, you were trying to hold his hair on, and his skull on." Releasing this previously withheld section gave researchers what was assumed to be Mrs. Kennedy's complete description of the President's head wounds. Researchers took for granted that the hand-typed transcript page released by the National Archives from the official records of the Warren Commission ended the matter. "... I could see a piece of his skull sort of wedge-shaped, like that, and I remember that it was flesh colored with little ridges at the top." Filmmaker Mark Sobel found the discrepancy while doing research for a forthcoming documentary on JFK. 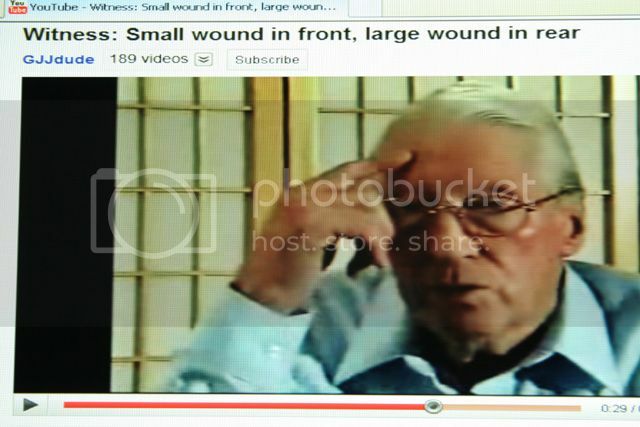 Sobel explained, "I was quite surprised to find that Mrs. Kennedy was not asked for more detail --- she had an opportunity to view the wounds longer and closer than any other person as they originally existed. Given the seemingly contradictory testimony by the doctors who treated the President at Parkland Hospital in Dallas just after the shooting and the Doctors who performed the autopsy at Bethesda many hours later, Mrs. Kennedy's testimony would appear critical." Sobel filed under the Freedom of Information Act to have the court reporter's original tape of Mrs. Kennedy's testimony unsealed, citing that the content had already been fully declassified by the courts and that it was in the best interest of the public for the accuracy of the existing transcript to be verified. Sobel explained, "As I compared the 1964 transcript to the original court reporter's paper tape, I reached a sentence officially transcribed by the Warren Commission as: "I could see a piece of his skull, and I remember that it was flesh colored"words on the original paper taped no longer matched up." Court Reporter Kathy Bradford of Bradford Court Reporting of Dallas, Texas, agreed. 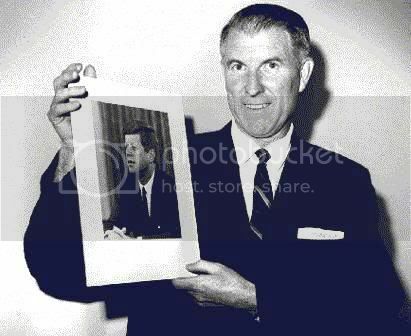 Bradford reviewed the transcript from the archives and certified Mrs. Kennedy's complete statement was not found in the Warren Commission's version.. This extra description was almost certainly witheld from the Commissioners and Legal Staff as well, since these descriptions are missing in the typed transcript that is contained in the actual Warren Commission Records --- before it was finally released publicly in its entirety. Apprised of these new details, David Mantik, M.D., Ph.D. stated, "Given the lack of follow-up in Mrs. Kennedy's description to exactly what she saw, these details could have been valuable to the House Select Committee on Assassinations that reviewed the medical evidence." Mantik is one of the few doctors allowed to view President Kennedy's original autopsy materials in the National Archives. Debra Conway of JFK Lancer, says that the court reporter's tape is now on their web site. Conway stated, "Mrs. Kennedy also describes this piece of skull to historian Theodore White in her famous 'Camelot' interview where she told him, 'I could see a piece of his skull coming off; it was flesh colored not white--' This is very similar to what she said to the Warren Commission." Conway went on to explain, "There were pieces of skull found in the street and in the limousine. The piece of skull described by Mrs. Kennedy could have been one of those later found in the street, the limousine, or an avulsed piece still attached to his head." Researcher Barb Junkkarinen, who specializes in the medical evidence of the Kennedy assassination and is the Director of the JFK Alliance for Open Archives organization, told JFK Lancer, "The real 'find' here is that two specific descriptions of the head wound by Mrs. Kennedy (that the skull piece was wedge shaped, and that it had little ridges at the top) are not included in what is supposed to be the full and complete transcript of her testimony." In his memoirs, Senator Arlen Specter, a Junior Council for the Warren Commission in 1964, suggests that the minimal testimony taken from Mrs. Kennedy was due to Earl Warren wishing to be protective of her, and that the handling of her testimony created some distress among other Commissioners and Legal Staff. However, in formerly Top Secret transcripts of the meetings of the seven Commissioners, Commissioner John J. McCloy repeatedly emphasized the importance of obtaining such testimony as quickly as possible "She's the best witness," he said "as to how those bullets struck her husband." Junkkarinen adds, "Why they would withhold an accurate description is open to debate, but the fact that they put out an altered transcript is telling. How many other transcripts may have fallen victim to the same shenanigans? This is a find that proves alteration of original evidence, and that is important. The driver shot Kennedy square in the right forehead with the bullet logically exiting the right rear. 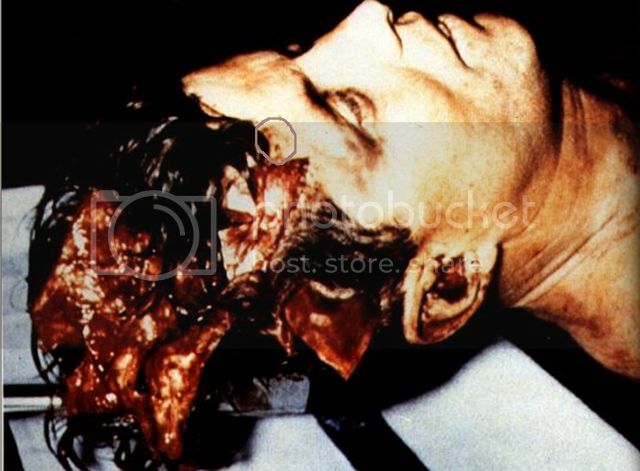 That exit wound is corroborated by 40 witnesses and my recent work showing that jfk's rear skull gaped open at the moment of front right impact. Notice the right rear missing in the autopsy pic and compare that to frame 313. FRAME 337 SHOWING REAR GAPE AND JACKIE'S SHOCK. Thank you, Deb. I am sure you knew this day was coming sooner or later but never could've imagined that you would receive partial credit for exposing Greer as jfk's real assassin. All your hard work has finally paid off by providing an internet sleuth the closest eyewitness to the exit wound that only William Greer could've fired from the front on that fateful day, November 22, 1963. 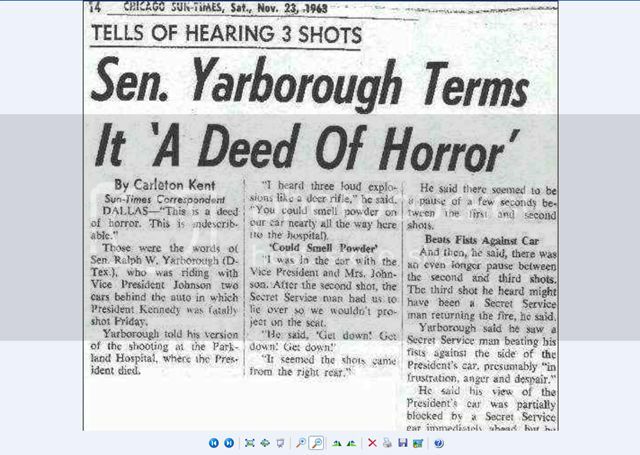 Tyler, years ago I found a jpg of a newspaper clip from the Chicago sun times, dated Sat., Nov 23, 1963, and not only is Senator Yarborough quoted as saying he smelled gun powder on LBJ's limo nearly all the way to the hospital, he is quoted as saying that the 3rd shot may have been from a Secret Service man returning fire! Can't wait to get my hands on this book after all these years, & hopefully, the DVD! All the evidence points towards Greer taking the final shot. A Murder Within was self published in 1974. Look on the right side, under 'beats fists against car'. It's the second sentence. The old man on the stairs literally points at Greer after he shoots Kennedy and then drops his arms as if to say, "I just saw the government kill Kennedy and there's not a damn thing I can do about it." You can also see Greer's left arm/elbow coming down after he shot jfk.